Adolf Hitler’s face decorates the hall as Kim Jong-un, North Korea’s eternal leader, sits ready to give a rousing speech. The audience looks on seemingly entranced. And suddenly, electronic drums thud over an apocalyptic string arrangement. Welcome to The Daily Traditionalist, a video blog by Matthew Heimbach, an American white nationalist who advocates dividing the United States into ethnically and culturally homogenous states. For many on the far right, the Korean peninsula’s secretive regime offers an inspiring vision of the future. Yet North Korea’s admirers rarely mention Pyongyang’s penchant for torture, extensive gulag system, mass famines, or thriving narcotics and meth industries. These inconvenient details are either deliberately avoided, or they are blamed on the West. Unsurprisingly, white nationalists’ affections for North Korea stem in no small part from their mutual anti-Americanism. Indeed, the far right’s admiration is an outgrowth of Pyongyang’s opposition to Washington, a government whose promotion of international liberalism is anathema to radical nationalism and the isolationism many white nationalists espouse. “American imperialism and American militarism cannot abide a country [like North Korea] that wants to be sovereign and that rejects the radical globalist agenda,” Heimbach tells The Diplomat, adding that North Korea has survived despite being a “pretty universal punching bag” among Western governments. Even Russia’s Alexander Dugin, an ideologue for white nationalists, has praised Pyongyang as an “island of freedom,” arguing that Russia should provide it with weapons of mass destruction to protect its sovereignty. Anti-Semitism is another factor bonding white nationalists to Pyongyang. In an online blog post railing against “global Zionism,” former head of the Ku Klux Klan David Duke writes that “as the Jewish Lobby dictates U.S. foreign policy, North Korea’s hostility toward Israel has made it a target for aggression.” Citing North Korea’s refusal to recognize the state of Israel, Duke writes that “the Jewish-supremacist media” has long singled Pyongyang out for destruction. Still, given North Korea’s Cold War origins, the admiration from white nationalists is a curious development. But in 2009, North Korean authorities removed all references to communism within its constitution, adding fuel to the argument that North Korea is a far-right regime. “After the [Korean Central News Agency] press release in 2014 likening Obama to a revolting monkey and poking fun at his ‘indeterminate bloodline,’ I would have thought it would be hard to keep pretending this is a far-left state,” says B.R. Myers, author of The Cleanest Race: How North Koreans See Themselves And Why It Matters — a book that argues against the Stalinist tropes in the international community’s perception of the country. According to Myers, North Korea is an ethno-nationalist regime with a deep-seated military industrial complex. Much like Nazi Germany, Pyongyang’s entire command economy is geared toward its armed forces, not public services. “It is a far-right state, practicing the ideology it preaches, and doing very well by its own standards — if not by our own materialist standards,” Myers tells The Diplomat. 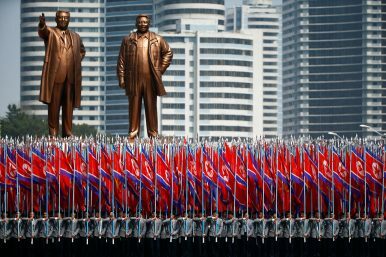 Myers suspects communistic mischaracterizations of North Korea to be politically motivated. The people who advocate that the United States should negotiate with Pyongyang regardless of its behavior would rather “evoke memories of successful Cold War negotiations with communist states than of the unsuccessful appeasement of Nazism,” he says. Interestingly, Myers’ book — and its argument that North Korea functions as a far-right state — appears to have accelerated support from Western white nationalists. Heimbach, for instance, says an “Asian nationalist” friend gave the book to him, and that the read “definitely opened my eyes” regarding the Kim regime. Whereas other governments admired by white nationalists — including Russia and Hungary — are now friendly to such far-right figures, North Korea is more cautious. It was not always this way. In 2003, an American neo-Nazi named Joshua Caleb Sutter said he was distributing Pyongyang propaganda at the behest of the North Korean regime. Likewise, as journalist Nate Thayer detailed, an American white supremacist named John Paul Cupp, the son of a fundamentalist Christian preacher, said he received a note from Pyongyang “extend[ing] militant greetings to you who extend warm support and solidarity” to North Korea. With Pyongyang’s apparent support, Cupp even rose to the fore of the U.S. Songun Politics Study Group, an organization dedicated to proselytizing North Korean policy. “The North as I see it is none too choosy about the foreigners it presents to its people as admirers of its leader,” says Myers. But North Korea has no interest in Heimbach so far. “I actually sent an email to the DPRK when the war drums were beating here [in the U.S.] just a few months ago, a message that not all Americans agree with our foreign policy,” he says. There was no response. Nevertheless, Heimbach remains enthralled and sees himself as a potential broker between Washington and Pyongyang.